In July of 2006 Microsoft released a stripped down copy of Windows XP that can be run on old hardware. It’s called Windows Fundamentals for Legacy PCs (WindowsFLP). The main difference is that some of the applications would not be run locally. The processor intense applications would be run off of a server. The server would be another, more powerful computer running Windows XP. I think that was a great thing for Microsoft to release. The problem is that they didn’t release it to the general public. It is only available to Microsoft Software Assurance customers. The good news is that 2X Software has a server and client application that you can use to achieve this called 2X Application Server. 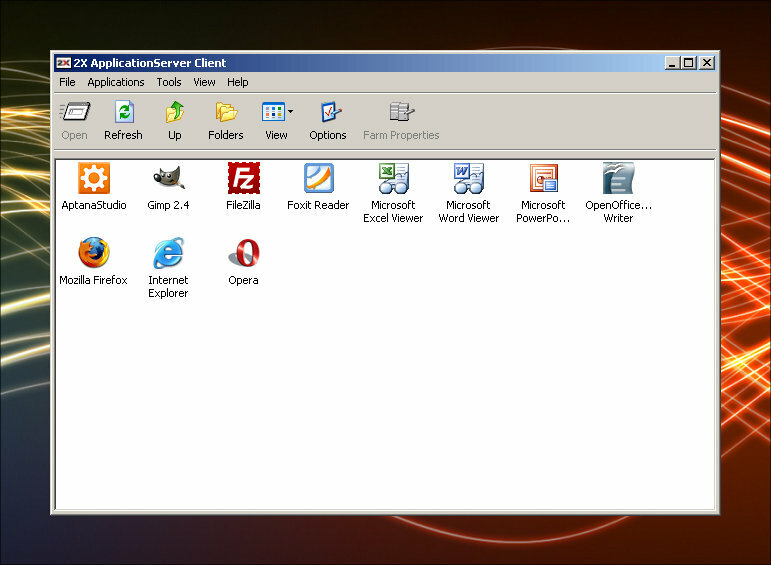 With the free version you can tunnel up to 5 applications per server onto remote desktops. You can serve applications out to Mac OS X, Microsoft Windows or Linux clients. This is something that WindowsFLP cannot do. To be fair, this does require a machine running Windows Server with the Terminal Services component installed. WindowsFLP only requires another machine with Windows XP. After installation it was very easy to push out an application to my old Windows XP laptop that has 32 MB RAM and a 200 Mhz processor. I chose Aptana (a web development IDE) as my test application. I installed the client software on the laptop after I had set up the server. In the client application I saw Aptana and double clicked on it to launch it. You can also choose to put a shortcut on your desktop. Aptana started up and looked as though it was starting up on the local machine. I was able to then use the application as if it were installed on the local machine. Though, when you’re accessing files it will bring up a dialog for the drives on the server. On Windows, if you have mapped network drives it will show those in the “My Computer” area. The Linux side of things was a little more difficult. The 2X Server Client software for Linux is command line only. It took me a few minutes to correctly enter the syntax but I was finally able to pull up the Aptana application on my installation of Fedora. It seemed a lot slower on Linux than it did on Windows. For you Mac fans out there you should be happy to know that they also have client software for the Mac as well. It works really well. I was able to launch Aptana without any issues. It does look a bit odd on the Mac, though. If you want it to look seamless you might install a program that changes the look of Windows to that of Mac OS X. Article update: Tuesday, September 30, 2008: I have updated this article with screen shots of the latest version. A lot of updates to the application have been made. It looks different and there are many more options. Instead of just a single application at a time, you can now also publish a group of applications. This allows you to group items in a folder. This is sort of like grouping items on the start menu. 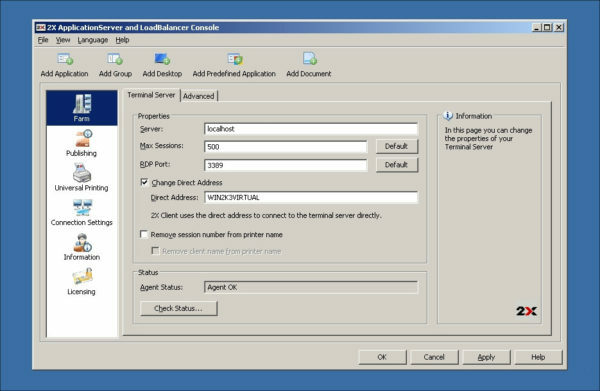 You can publish a desktop which gives the user access to their remote desktop without having to use another remote desktop client. You can also publish predefined applications (Windows Explorer and other built in components of Windows) and documents. The latest Mac and Windows clients work really well. Unfortunately, the Linux client is still command line only. I think if there was a GUI version for Linux it would make it easier on the IT staff and the employees who aren’t technical.